The majority of episode four of True Detective is a slow burn. We’re being drip-fed information about the case, the land deal, Caspar’s past and our protagonists throughout the hour. Every new detail is fascinating in the moment, but only leads to a craving for more. Even as the puzzle of the plot is slowly being pieced together and the characters are fleshed out and realised as three-dimensional people, there remains a shroud of mystery, obscuring and confusing enough to keep us tantalised. So far, Paul Woodrugh has been one such enigma. In episode one he seemed unhinged, exhibiting crazy, suicidal tendencies, and at the time we had very few clues as to what was driving him to this extreme. Over the next couple of episodes, his struggle with his sexuality has been revealed. A soldier; a tough guy; the prototypical alpha male – Woodrugh seems compelled to embody this persona, and to do so he feels the overpowering need to bury his feelings for his brother-in-arms from his combat days in the desert. He’s a man who feels defined by his role in society, and is thus unsure of who he really is. After waking from a night spent with his lover, Woodrugh is repulsed to find himself in this situation again. He’s visibly shaken by the dual life he’s forcing upon himself, and no longer able to contain his emotions, this inner turmoil escapes in an outburst on a city street. 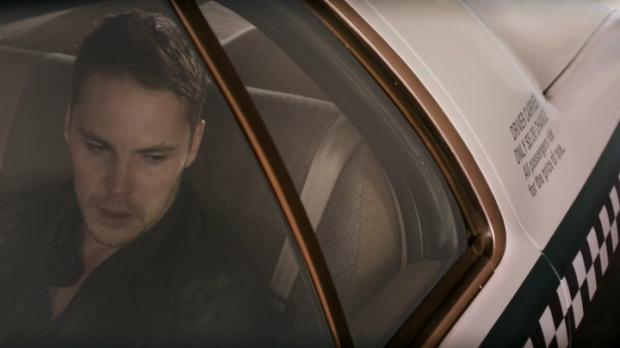 This is the most outward expression we’ve seen from Woodrugh so far in the season, and as such the first time Taylor Kitsch really gets to let loose. The rage he seems to handle with ease, but it’s the quieter moments, when discussing as much of his situation as he’s comfortable sharing with Velcoro, that we really get the impression that this character is at his wits end. He’s strung out on a cocktail of drugs, alcohol and emotional chaos. He says to Velcoro, “I just don’t know how to be out in the world”. This statement is intended to refer to his days in the army and the police, but there’s a double meaning that for us an audience is clear. Later in the episode, Woodrugh’s on-again-off-again girlfriend reveals to him that she’s pregnant. We can see the gears turning as with relief Woodrugh seizes upon this opportunity to ‘confirm’ his heterosexuality to himself by suggesting marriage, telling her “this is the best thing that could happen” and (unconvincingly, to us) that he loves her. Her muted acceptance and response of, “I guess I love you too” and his relief at being given a solution to his ‘problem’, is heart-breaking for the audience, as we witness the lengths to which these characters will go to conform to societal pressure. Woodrugh struggles to come to terms with himself. Meanwhile, more about the Caspar case is revealed through Velcoro and Bezzerides’ investigation. They visit some of the areas that were involved in Caspar and Semyon’s deal and find out that the land has been contaminated by mining runoff; the farmers in the region have been selling up and moving on due to this. The cops also question Mayor Chessani’s daughter and through her we learn more about the corruption at the heart of Vinci. She tells them, rather cryptically, that “there’s no rules, you see – that’s how it’s always been”. Is she talking about her home life or the Mayor’s approach to his position? She goes on to admit that her father is a “very bad person”, and then leaves abruptly. More plot threads begin to tangle as we discover that Chessani’s family, Caspar and Caspar’s psychologist, Pitlor were involved with the spiritualist sect run by Bezzerides’ father. The connections between them run back for generations. At one stage, Bezzerides’ father stops in his tracks and tells Velcoro that he has “one of the largest auras I’ve ever seen”. Velcoro lets this wash over him, with little more than a nod. The preacher goes on to state that Velcoro “must’ve had hundreds of lives” and Velcoro retorts, sagely, “Well I don’t think I could handle another one.” It’s a funny little character moment for Farrell, in an episode in which he plays more of a supporting role, but it says a lot about both the actor and the character he is portraying. Throughout this sequence the occult themes that were a hallmark of season one are beginning to be woven into the narrative. Remember the crow’s head mask from episodes one and two of this season? That has to tie in somewhere. Shortly after speaking with her father, Bezzerides is called to a meeting back at the Sherriff’s Department. She’s being cited for sexual misconduct because of her relationship with a subordinate. Bezzerides called the relationship off in the last episode, but a departmental suspension, and the mention of her gambling debts tips her off that Mayor Chessani has prompted this action as a response to her investigation of his home. Again, the Mayor is involved in pulling the strings behind the scenes. After speaking with his daughter and witnessing his reach into her personal life, Bezzerides (and by extension, the audience) has to believe that the Mayor is heavily involved in the Caspar murder – to what extent remains to be seen. In this sequence there’s also a nice callback to a couple of weeks ago, when Semyon spies a couple of stains on a table cloth. These resemble the ‘inkblots’ on the ceiling of his bedroom, and the look on his face reminds us the vulnerable side of his character we saw back then. He quickly covers the stains with his coffee cup, pushing his weakness to one side, allowing him to concentrate on the job in hand. Vaughn maintains the strong work we’ve seen from him thus far, with only this Rorschach memory causing a blip in his otherwise level performance this week. With Velcoro monopolising much of the first two episodes, and Bezzerides and Woodrugh getting their due since then, Semyon remains ever so slightly underdeveloped. This could be a symptom of his position removed from the other three protagonists, but hopefully his relationship with Velcoro will bear dramatic fruit and Vaughn will have the opportunity to square off against Farrell, if not the others too. The episode culminates in a raid where the cops are looking to apprehend a pimp who’s been pawning off Caspar’s belongings. As the cops gear up, Woodrugh lays out the plan and Bezzerides calls the shots. They move into position but come under fire. What seemed like a routine operation quickly escalates into a massive shoutout that spills out over several city blocks. As the suspects attempt to flee in an SUV, Bezzerides exhibits her determination and lack of concern for her own safety as she chases the vehicle on foot while coming under heavy fire. The SUV crashes into a bus and multiple civilians are caught up in the bloody action. The tension is ramped up as cops and criminals fire volleys across the streets and through crowds of people. Woodrugh’s military experience comes to the fore as he remains calm, in a sort of trance, under fire. The three cops eventually surround the last remaining gunman and take him down, but not before the entire area has been littered with bodies. Farrell and McAdams are called on to convey the gravity of the scene as both Velcoro and Bezzerides are clearly shaken by the carnage. As the emergency vehicle pull in, sirens wailing, the scene fades to black and we have to wonder, where do the cops go from here? This episode builds slowly towards and action-packed climax. Semyon shores up his place in the criminal underworld. Velcoro takes a backseat as Woodrugh and Bezzerides come to the fore and we learn more about each of them. Taylor Kitsch, in particular, gets the chance to show that there’s an actor under the good looks and muscles. The investigation into the murder is progressed sufficiently, but tantalisingly enough to keep us scratching our heads. Spirituality and hints of the occult are brought into the picture, adding further intrigue. A routine bust at the culmination of the episode turns into a bloody shootout, leaving cops, criminal and civilians dead in the streets. How will these broken cops recover from this? Can they recover?